Does your sports organization struggle when you need graphics, QUICK? Made the playoffs? Season ticket plan announced? Player of the week? Championship won, gear available? This list goes on and on. We know the cost (both opportunity and monetary) that follows the need for graphics in an organization. Social media posts, ads, website banners, headline images, posters, emails… all instances in which images are needed to accompany a message and STAT. It gets tiring, frustrating, and costly which is why Infinity has rolled out a solution to this common problem. We’re proud to introduce, G-Force by Infinity. 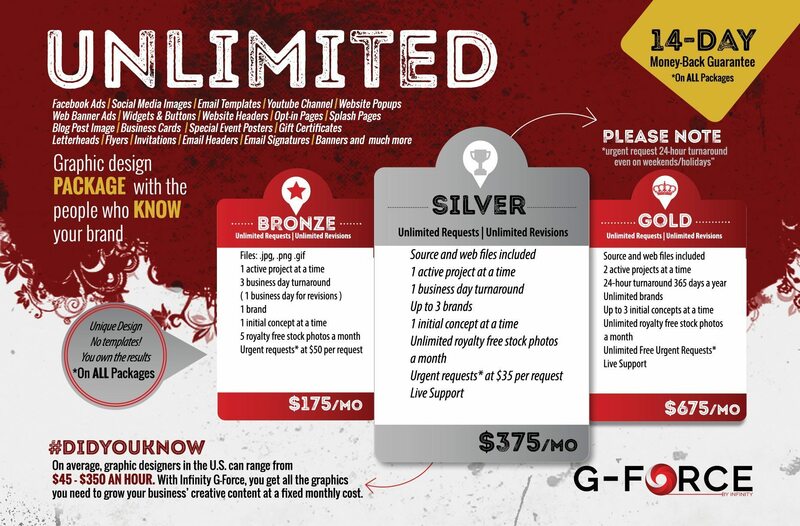 A monthly package that gives you unlimited requests, unlimited revisions, and unique design on every graphic you need. Not to mention, no templates are used and you own the results produced. Plus, there’s a 14-day money back guarantee. See below for more info and contact your project manager to get started!